Thank you for all the kind feedback on episode 1 of my new podcast. The second episode of is now live. The podcasts is also available on iTunes or PlayerFM. 100% Poll Dorset lambswool from Northern Yarn. 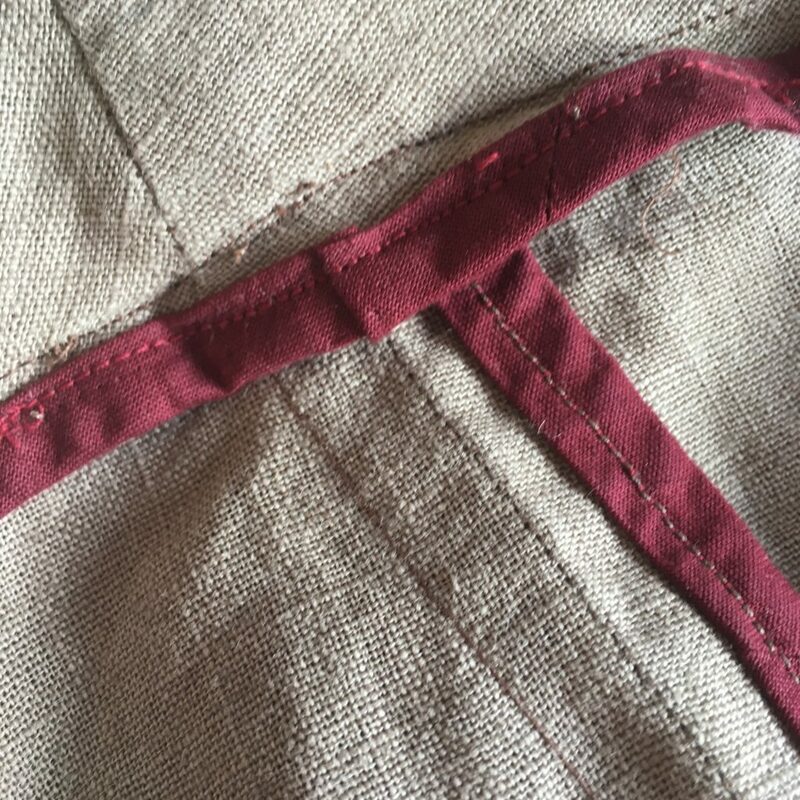 I also talk about an often ignored aspect of sewing: post-completion adjustments. Not only are they part of my learning curve as a new sewer, they are also one example of “craft of use”, a term I’ve adopted from Kate Fletcher’s book Craft of Use – Post-Growth Fashion. The skirts I modified are simple A-line skirts (made from the discontinued Simplicity 1717 pattern). 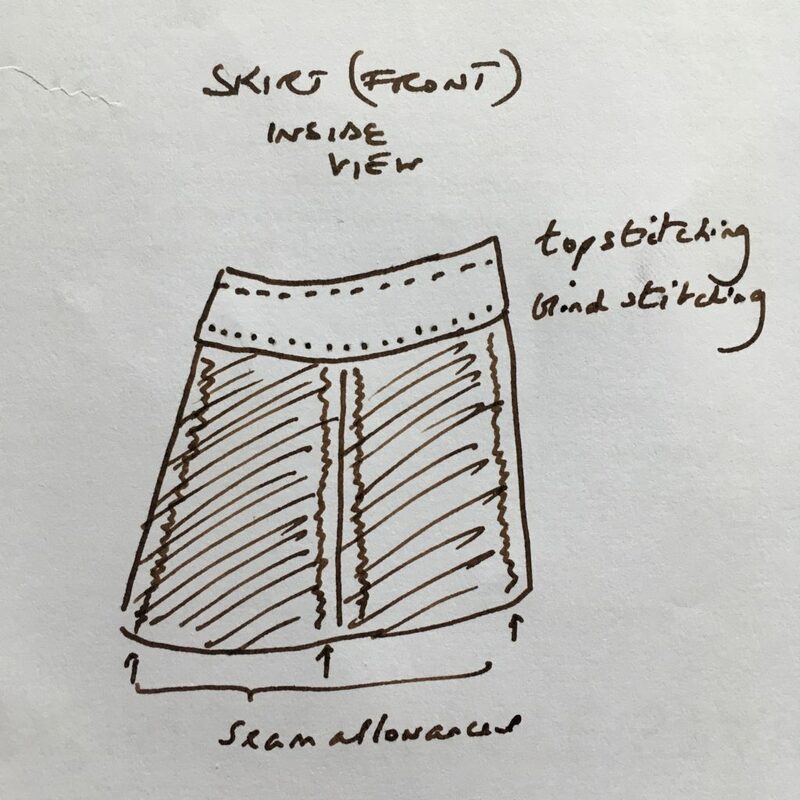 The graph below show the construction of the skirt (inside view) and my less than perfect modifications, of which I’m rather fond because rather than despite of the flaws. Finally, I talk about dabbling in some kitchen alchemy after attending a workshop on fermenting organised by Hubbub UK, an environmental behaviour change charity. I also mention the excellent blog The Zero-Waste Chef, which is a good place to start if you want to try fermenting. Anne-Marie, the blog’s author, also runs occasional webinars on different types of fermenting. The next one, which is about sourdough starter, takes place on 3 May. 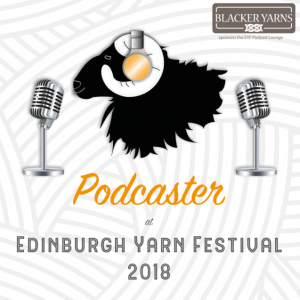 Please feel free to contact me about anything discussed in this podcast using the comments below, or by contacting me via Ravelry or Instagram. In keeping with my blog’s policies, I have not received any inducements in respect of anything mentioned in this podcast. For complete transparency, Blacker Yarns did kindly send me the Mohair Blend shade card after I had bought the yarn and had decided to include it in my sock experiment. Another excellent episode! I usually spin while listening to you and other podcasts and it’s incredibly enjoyable. Thanks for the mentions of the various books- especially Craft of Use. I’ll have to hunt that one down. I will certainly tune into Zero Waste Chef webinars. I have never tried fermenting myself but have assisted others. When you mentioned your workshop I thought of another Australian chef – Kylee Newton. Her book is The Modern Preserver and I really love it. I have stuck mostly to chutney and pickles but fermenting is certainly in my future. I look forward to hearing about your experiment as it goes on. I’m not much of a sock knitter but I do make a lot of gloves. Another lovely episode. I shall follow your sock experiment with interest. I’ve knit a pair of Kate Davies’ Baffies using her Buachaille but I tend to only wear them around the house or as bed socks in the winter so can’t really comment on the wear and tear, although they have stood up to several hand washings with no problems. The other non-nylon pair I’ve knit was using Triskelion’s Elen Sock yarn which is superwash, but 100% wool. I haven’t worn them much for the silly fear of wearing them out as they took a long time for me to knit. I really should just put them on and see how they wear. Another enjoyable thought provoking episode. I used to buy my Dad angora mohair socks which he loved from a small producer near me in Aberdeenshire and he wore them for fishing. Sadly they don’t seem to still be in business. Thank you for sharing your memory. I imagine cosy socks are necessary whilst out fishing. Or in Aberdeenshire full stop as it can pretty Baltic there. Another very interesting episode Meg. By coincidence I am currently knitting a pair of 100% wool socks following a conversation with Sonia at EYF. I had a fair bit of of Blacker Classic 4ply left from my Tups jumper and Sonia told me that it makes excellent socks – she has had a pair for about a year and they are wearing extremely well. I don’t think I’ll be wearing them until the autumn once their finished as it is knitting up quite thick at a tight gauge. I do already have a pair of 100% BFL socks (superwash so not entirely natural!) which are very soft and warm. They do pill and I tend not to wear them if I’m going to be doing a lot of walking but they are doing well. I also made a pair for my daughter out of Whistlebare Cuthbert Sock (80% Mohair, 20% Wensleydale sport weight) again knitted at quite a tight gauge, which seem to be fairly indestructible – she walks everywhere too. It is interesting to see how these no-nylon socks compare to ‘standard’ sock yarn. On my sample of 2, I’d say they stand up quite well and I will no longer assume that socks have to contain nylon. Thank you for sharing your experiences. I have heard many good things about the Whistlebare Sock Yarn. I’m saving my pennies for an experimental skein. Such an interesting episode. I really want to go back and listen again! I’m interested in your sock experiment. We have access to Blacker yarn here from The Woolly Thistle and I may just have to grab some of the Manx or Hebridean blend. Thank you Amy. The Mohair Blend is a very lovely. If you didn’t know it was mohair you probably not know. It’s not the fluffy puffball mohair of the 80s. Loved the podcast. Thankyou! 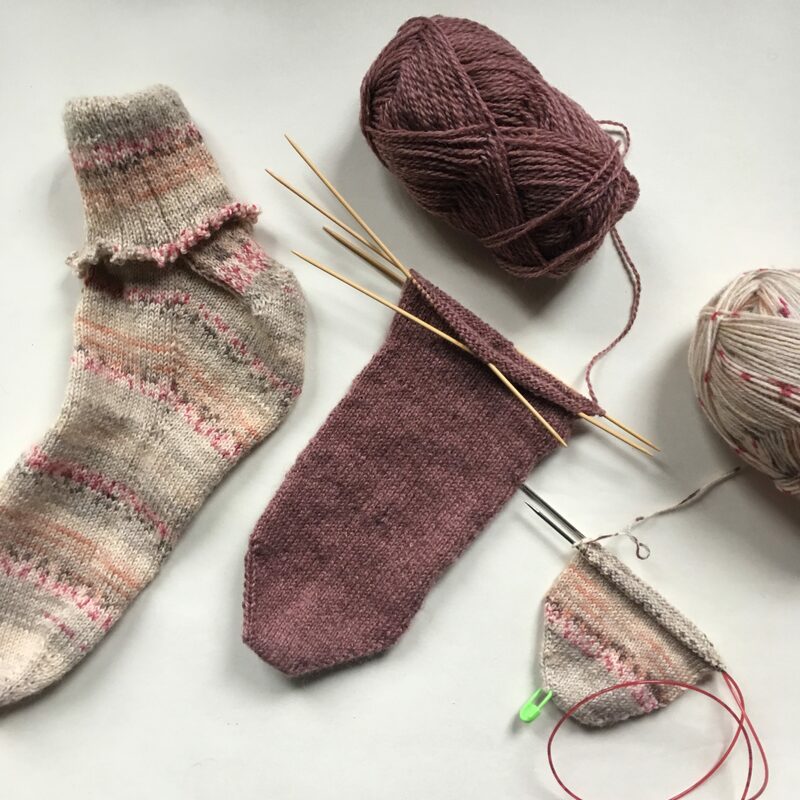 I have been knitting merino socks (worsted weight and stranded) and going through the heels for seven years now with my pokey-boney heels in my great hiking boots. I found two solutions that work well. One is to reinforce (by holding the two yarns double) the heel flap with quilter’s heavey cotton thread or heavy button/coat thread. It looks speckly, but it really holds up to tromping in desert boots miles and miles everyday. The other is a new trick from an old ’50s knitting newsletter called “The Beehive Aladdin Heel”. It’s not really magic, it only suggests using a length of contrasting colour for the last row of the heel turn, the first row of pick up stitches, then you drop the contrast colour and reattach the working yarn for the top of the sock, then use the contrast colour again to pick up the second set of gusset stitches. This gives you a line of colour with which to pick up and reknit the heel flat when you need to reknit the heel and find it in all the felted and crushed wool. Hope this helps some other knitter who wrecks their own socks so wrecklessly. Thank you for your kind comments and sharing these mending suggestions. I love the Beehive Aladdin Heel idea! Thank you, Christine. I’ll be keeping an eye on your experiment too! Thank you for sharing your blog details! I think when we start to delve, there are quite a few of us growers, makers, inquisitive souls… We just don’t necessarily get to bump into them in our immediate environment but thanks to the interweb we can connect! 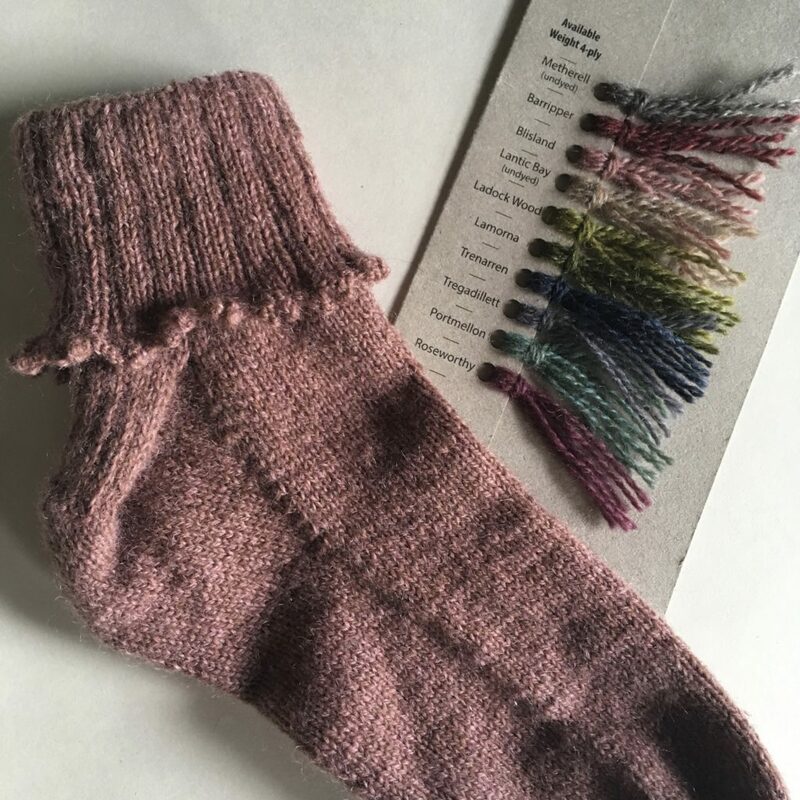 Listening to episode 3 but had a thought about non-nylon blend socks: would a wool-silk blend work in your experiment? Isn’the nylon the man-made fiber meant to substitute for silk? I think a wool/silk blend will work, provided the silk portion is modest. Maybe 10-15%. Silk blends tend to be full of drape which makes lovely scarves but potentially wrinkly socks. Thank you for the referral to Craft of Use. Ill be after a copy. I greatly appreciate the thoughtful and mindful details of each of your podcasts. I have been working my way backwards from most current. I hesitate to comment much until read more of other comments and commenters; understand the expectation for the depth of dialogue; and I feel less the outlier, blasphemer and infidel. However, this concept Craft of Use has definitely tweeked my Curiosity. Altho I value and use the “f” word (fashion) as little as I use sustainobabble terms in my ecosensibiities, this phrase, the “craft of use”, seems to draft and twine with more affinity into my own decades and decades of untanglings, deconstructings and remakings in lifelong experiential explorations of handwork and women’s work. I will have to do more unwinding here on the farside of the socioeconomic margins of western consumptive culture. But I’m fascinated and chastise myself for missing such an intriguing concept. Thank you again for sharing these texts. I find each of your podcasts remarkably wonder filled in reaching deep into my own experiences with making when the realities of the environments we live and love and leisure within are so vastly different. Remarkable. Remarkable. I say again with unexpected joy.